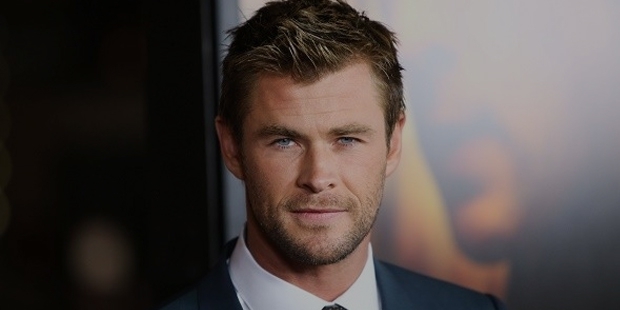 Chris Hemsworth is a name that exemplifies success after simplicity. 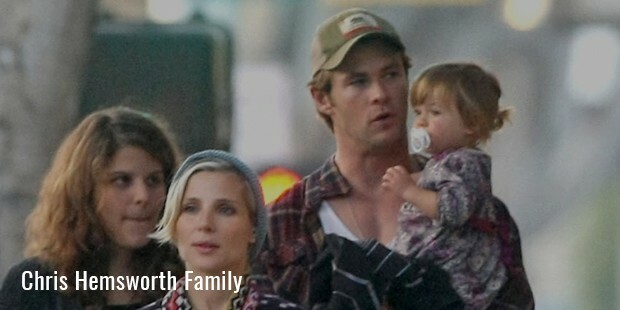 Known fondly as ‘Thor’ among his many fans all over the globe, Hemsworth came a long way from humble beginnings. His Australian accent and handsome personality makes him a rage among his female followers today. Chris was born on August 11th 1983 in Melbourne, Victoria, Australia. His father was an educationist and worked as an English Teacher. His mother was a counselor in one of the departments dealing with services to the mankind. He was nurtured in a middle-class environment and had a much-grounded life style. Chris Hemsworth had mentioned in one of his interviews that as a child and teenager he spent most of his time in cattle stations and then back again in Bulman, Melbourne where he had a great time with crocodiles and buffalos. He completed his High School from Heath Mont College. He has one elder brother, Liam Hemsworth, and Luke Hemsworth, the younger. Both of them are well-known actors. Chris wanted to carve out a niche for himself in films and television. He auditioned for an Australian Soap, Home and Away in 2004 but unfortunately could not get a role in it. Later on he got the chance in the same Soap and had to go to Sydney along with the cast and crew for the shooting. After that there was no looking back. Chris Hemsworth performed in 171 episodes of Home and Away. 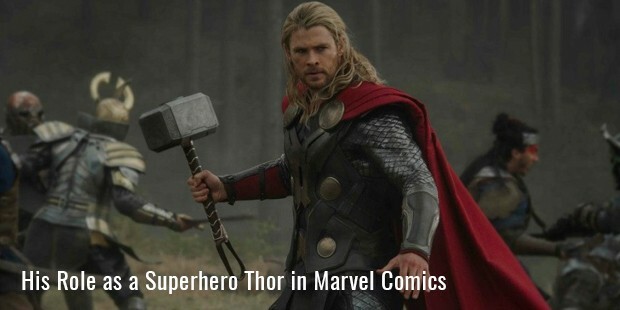 Eventually he left the show because nothing substantial was left for him.Hemsworth became really popular for his role as a Superhero Thor in Marvel Comics. He had mentioned that the character demanded him to gain weight, making him put on 20 pounds. Hemsworth depends a lot on method acting and considers it to be his forte. In 2013 Chris’s movie Rush became a rage. It is a movie highlighting the sports. He starred with Daniel Bruhl and displayed the role of a Formula1 champion James Hunt. The role gave him a tremendous response from the audience, giving him much aspired star status. Chris Hemsworth has been awarded many a times for his versatile roles. He received Teen Choice Awards for the movie Breakout. He won the Bafta Rising Star Award and People’s Choice Awards for the movie Superhero. Besides that he was also nominated for the Best Actor Award for the movie Thor which was a block buster. 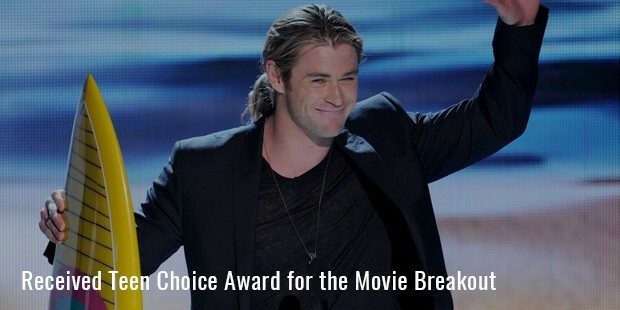 Hemsworth was also nominated for Kids Choice Awards and received it for being a Favorite Male in Buttkicker. Chris’ performance as an action hero made him the recipient of MTV Movie Awards for the film The Avengers.As a person, he is quite reserved and takes some time before wearing his heart on his sleeve. He met Spanish actress Elsa Pataky through a mutual companion and fell in love with her. In 2010 both of them started dating after which, they finally tied the knot. 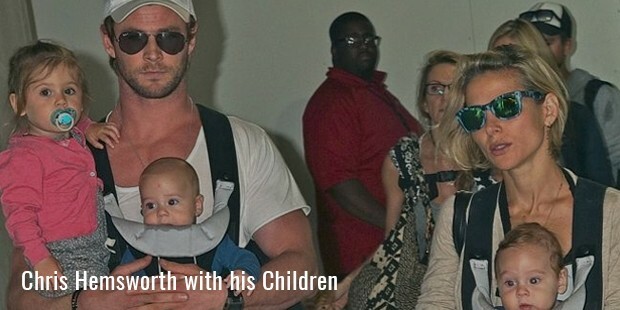 Hemsworth is also a loving father of three children. He has two sons who are twins and one daughter whose name is India Rose. Chris has expressed that acting is something which gives him creative satisfaction and a great high.